California's rainiest week in more than two years will bring mudslides, floods. 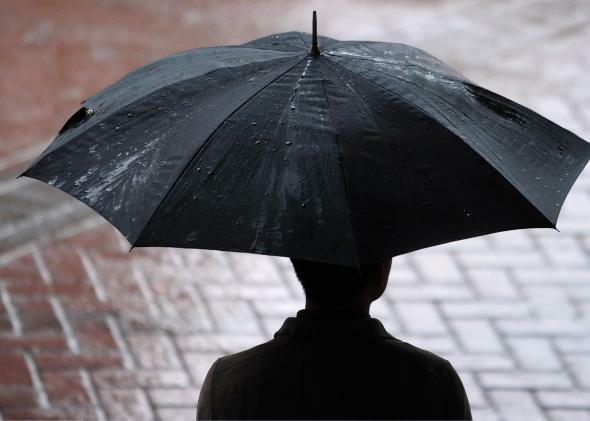 Stop the presses: This week, it’s going to rain in California. The ongoing epic drought out West is already costing billions and shutting down some of the most fertile fields in the country. Now, a routine rainstorm could cause mudslides. As a result, what is essentially a typical West Coast winter storm is beginning to garner blockbuster status in Los Angeles. Point of fact: “Rainstorm” is currently the top trending topic on the Los Angeles Times’ website. The forecast confidence for this particular storm is above average, according to the National Weather Service, which seems to have made storm tracking an activity rivaling celebrity gossip this week in Southern California. But the storm itself won’t be that unusual. Still, it may cause an outsized impact. Here’s why. According to a Slate analysis of historical weather data from downtown Los Angeles, for the last 100 years, it’s been a virtual certainty (92 of 100 years) that an inch or greater rainstorm would hit L.A. at least once per winter. Problem is, there hasn’t been such a storm since Oct. 5, 2011. In fact, the current 28-month dry spell is unprecedented in L.A.’s historical climate record. The good news is, the National Weather Service is forecasting that streak to end this week. The biggest storm of the year and possibly 2 or 3 years remains on track for Friday and Saturday. It is remarkable how consistently the models have handled this storm and confidence is much higher than normal for a storm this far out. Preliminary rainfall amounts for this storm call for 1 to 2 inches for coastal and valley areas with 2 to 4 inches in the foothills and mountains. … With even higher (maybe way higher) amounts possible along south facing slopes. Snow levels on Friday will generally be above 7000 feet. … But will drop down to around 5000 feet by Saturday. This storm will likely produce significant amounts of snow. The bad news is, there’s been a lot of forest fire debris that’s built up over the last two-plus years in the foothills of L.A. County. “Unprecedented” fires were burning as recently as last month. Recent fires tend to leave a lot of bare ground exposed. The lack of vegetation limits greatly increases the fraction of rainfall that goes to runoff (rather than slowly seeping into the soil to recharge groundwater and help eliminate drought conditions). Heavy rains this week over burned areas could be strong enough to cause mudslides, essentially liquefying the soil and burying whatever lies downhill. The Centers for Disease Control and Prevention says that mudslides kill 25-50 people per year nationwide—about as many people as tornadoes. And the rains still won’t make that much of a difference in the current epic drought. Last week was the first time on record that a full 100 percent of the state moved into drought or pre-drought conditions. As I wrote a few weeks ago, when a lesser rainstorm hit Northern California, it would take an incredible amount of rainfall—10 to 20 times this week’s storm—to eliminate the tremendous deficits that have built up over the last two or three years. Two cutoff lows will combine into one just off the California coast. If models stay on track … you can expect periods of heavy rain … especially across south facing foothill and mountain slopes. There could be some waterspouts or weak tornadoes over coastal areas on Friday into Saturday. The biggest boon this storm will bring is increased snowpack in the mountains. During the summer dry season, it’s this melting snow that forms California’s water lifeline. Currently, statewide snowpack is at dangerous, record-low levels. This single storm may boost them by 50 percent or more—a big help, for sure, but not a game-changer. Looking out over the remaining few weeks before statewide snowpack typically peaks–around April 1—there is little to hang your hat on. After this week’s rain and snow, abnormally dry conditions are expected to return until at least March 23.